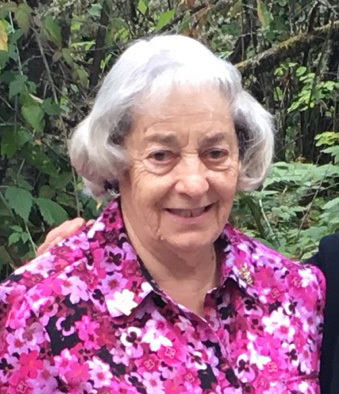 Doris Trimble Uhlman of Lake Oswego, Oregon, and a Moscow native died on her birthday, August 14, 2018 at the age of 84. Doris was born August 14, 1934 in Moscow to Merle (Jack) and Frances Cooney Trimble. She grew up in Moscow attending the Ursuline Academy. She was a cheerleader and president of her senior class, graduating in 1952. She worked at Bob’s Donut Shop and the Owl Drug Store. She and Robert Uhlman were married and made their home in Ontario, Oregon before moving to the Portland area where they have lived since. Doris was a long time employee of the Red Coach Inn in Milwaukie, OR. She is survived by her husband, Robert and her children, Patti Ann Gregg and Shawn and Kelsie Uhlman, both in Lake Oswego and Karen and Jim Meyer of Gladstone, OR. She also leaves five grandchildren and 7 great grandchildren and her sister, Betty Wernecke of Moscow. Doris was preceded in death by her parents and brothers, Robert and Jack Trimble. Donations are suggested to ovarian cancer research fund alliance @ocrfa.org, or locally to the Moscow Fire and Ambulance Fund, or to a charity of choice. Online condolences may be sent to www.shortsfuneralchapel.net.